This solder paste dispenser is generally to be used with any solder paste in a syringe (or flux, a liquid, glue,..) with syringe volume 10 to 15 cc. Two buttons for PRESS and RELEASE turn stepper motor shaft left or right and move piston in syringe in chosen direction and force the liquid or paste in syringe to move out through needle. Appx. 25x Pressings make 1 (one) rotation of the piston which moves the piston for apx. 0.5-1mm in the syringe. Power Supply needed is 5V DC – 0.5 to 1A. I simply use USB cable and phone charger or computer USB port, spare phone USB battery pack…or similar. Due to fact that many Solder Paste Co. request in manuals storage of the Solder Paste in cool areas with 0-10deg C please note that Syringes stored in fridge shall be heated up with hot air/ shrink tube gun / hair drier or in hot water to 40-60 deg C for better viscosity of solder paste for use with this dispenser. 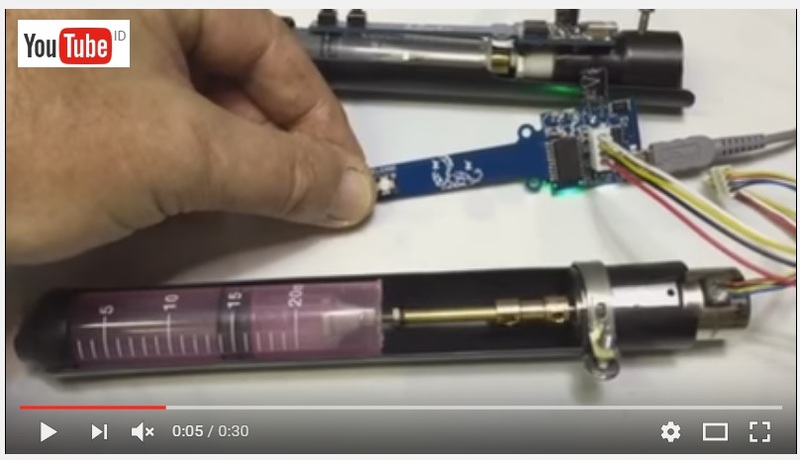 Here is one of my first prototypes of dispenser using larger syringe 15-20ml.